This is the twentieth in a series of blog posts by NBCC board members covering the finalists for the NBCC awards. The awards will be announced on March 6, 2008, at the New School. How can a poet whose formative experiences include service in Poland’s Underground during World War II and many decades spent under Communist rule write poetry that sounds so utterly contemporary? That’s the thought that races through one’s mind while reading Tadeusz Różewicz’s “New Poems,” a collection combining the three volumes the professor’s knife, gray zone, and exit, all ably translated by Bill Johnston. And races is surely the operative word here, for Różewicz’s spare, distilled lines simply pour down the page like water over a mountain’s edge, and once caught in the flow the reader is not likely to stop. It’s that seductive. Różewicz is master of the ordinary in ways that can be deceptive. His image for the horror of the Holocaust? Trains lumbering by in raw monotony. And then the trains that “fly past / like black birds / …end their flight / in a fiery oven / from which no / song rises,” and one’s heart stops. Later he admonishes us that hatred “will crash like an avalanche / onto humanity / not onto “humanity”! // onto people.” Real people suffer real indignities, and we deal in abstraction at our peril. Simple. Concrete. Everyday. Scraped to the minimum, as life often is, but indefinably brimming. That’s the classic Różewicz poem. What other poet could so effortlessly, so unfussily, turn the act of eating hard-boiled eggs and salt with a friend into a reflection of 21st-century complexities? Or sum up humanity—no, people—by observing “humans invented the wheel / wrote Faust / and began printing / paper money”? Or define real luxury thus: “I listen to the rain falling / I read poems”? In the end, says his compatriot Małgorzata Baranowska, Różewicz’s poems are marked by what it “recognizable and at the same time new”—the commonplace enfolding revelation. In its stark simplicity, that’s a sentiment that could have been rendered by Różewicz himself. 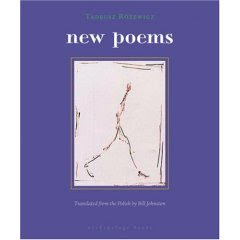 "NBCC Award Finalists in Poetry: Tadeusz Rozewicz’s “New Poems”" was posted February 27, 2008.